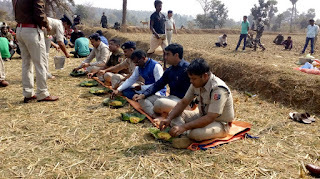 Home / Breaking News / Social News / Top News / West Bengal / Smiling Junglemahal overcome it's violent past!! Smiling Junglemahal overcome it's violent past!! 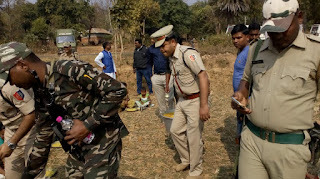 Indiapost24 Web Desk- Today Bankura District Police has observed the 9th death anniversary of Constable Sanjay Kumar Ghosh of SAP 7th Battalion who was kidnapped and brutally killed by the Maoists on 25 January ,2010 during an anti Maoist operation in the evening near Murkum village , Barikul PS.. Thus that Constable made the supreme sacrifice in the line of duty.Though all the criminal perpetrators have been brought to justice and there is peace in the area - such transformation owes much to the sacrifice of police personnel like Sanjay Ghosh added some critics. 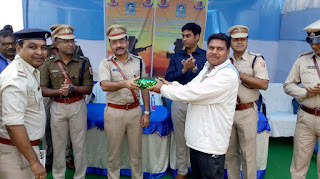 Making it a part of the community outreach program all Police officers and other guests present have enjoyed and encouraged the local finalists of the ' Bou Bosa ' game (an interesting version of Kho Kho) and offered a special prize of Rs 2000/- for three teams to encourage all the participants added SP Bankura K.N.Rao..Khichudi was also served by the police officials and other guests and at the end they sat in the fields and enjoyed the Khichudi feast . As per Junglemahal critics it is a mark of the changing times where role of Police in society is changing and a smiling Junglemahal has overcome it's violent past! !